From being a college student to being Miss Grand Forks, each day presents new experiences that help me grow and gain lifelong memories. As I enter my last two months of college, with graduation heavy on my mind, I also enjoy my role of serving the Grand Forks community as Miss Grand Forks 2018. Both roles present a busy schedule. I start my morning with a fresh cup of coffee because it will always bring a smile to my face. If there is one thing people should know about me it is my love for all things coffee. I also spend time listening to podcasts while I play Sudoku. I enjoy Sudoku because it is a great way to give your brain some exercise, plus it is so much fun! My day includes class, homework, and working as a Peer Advisor at UND Career Services. This year I have met countless students and helped them in perfecting their resumes and interview skills. It has been rewarding to see their growth and even more special when I see they have landed the job or internship they applied for. 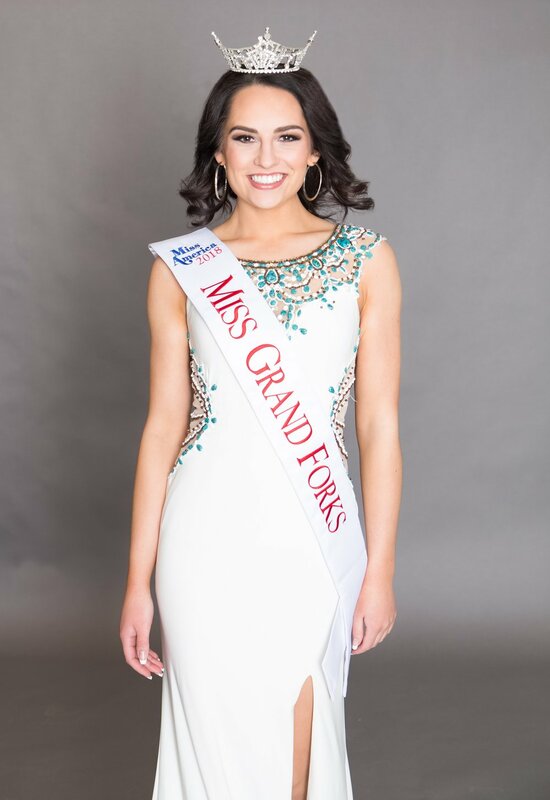 As Miss Grand Forks I have the opportunity to attend events and make appearances throughout the community. Whether I am presenting my platform to a local troop of Girl Scouts or attending Women for Philanthropy events, which celebrate the success of women in the community. These events and appearances give me the opportunity to express the importance of my platform. My platform is another important step in my preparation for Miss North Dakota, but it is also something I work to incorporate into my everyday life. I am currently pursuing a Minor in Leadership from the University of North Dakota; which coincides with my platform “The Leadership Generation”. In order for me to be an effective leader I am learning about numerous leadership theories and skills that I can apply to my platform presentations and leadership education program LEAD. Miss North Dakota preparation is also a huge part of my day. I enjoy going to the gym throughout the week and attending my weekly personal training sessions. This part of my preparation has been incredibly rewarding and has me feeling confident for the moment I hit the stage at Miss North Dakota! I have noticed that I have more energy and motivation to get things done since adding the gym into my daily routine. Involvement has been a major part of my time in college. My sorority, Kappa Delta, is incorporated into my life daily. I live in my sorority’s house on campus and enjoy every moment I get to spend with my sisters. Throughout the past few years I have lived in my sorority house and have loved spending nights watching American Horror Story, The Bachelor, Netflix, and more. I am lucky to get the opportunity to spend every day with inspirational, strong, and confident women. They have been a huge part of my time in college have been great supporters of my journey as Miss Grand Forks. Regardless of how busy my days may get I always enjoy ending my day with a facemask, a cup of tea, and a show on Netflix. Some of my favorite shows on Netflix recently have been Glow, Parks and Recreation, New Girl, and the occasional comedy special. Amy Poehler is one of my favorite comedians and has never failed to make me laugh. If you have never seen Parks and Recreation before, and have a genuine appreciation for Amy Poehler, I would definitely recommend adding it to your list. Before I turn in for the evening I write in my journal. I write down three things that made me happy, three things that were not so great, and give myself goals for the next day. This helps me focus my mind and get excited to take on the morning once again. Although every day presents new challenges, I never take that day for granted because that one challenge can lead you somewhere you never thought was possible. As Walt Disney once said, “Around here, however, we don’t look backwards for very long. We keep moving forward, opening up new doors and doing new things, because we’re curious… and curiosity keeps leading us down new paths.” I am excited to keep moving forward through this year and see which paths my curiosity leads me towards.